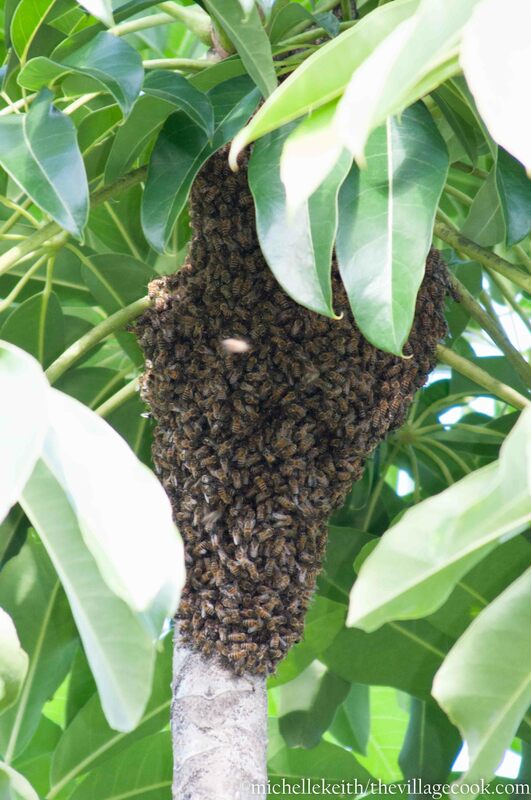 Last week, a swarm of bees showed up in my backyard. My husband frantically said, ” Get the kids and dogs in! ” Then, we watched from the screen porch as the swarm began to settle 12 feet up in a tree in our yard. After 24 hours, I began to grow concerned with their presence and my mind began playing scenes from grade B 1970’s horror movies. So, I started calling people. I was surprised to find a lot of people wanting to do the job for free, I left messages and sent emails and finally, got a hold of a man named Jim. I explained I had kids and dogs… he said that was fine. He went on to tell me all I need to do is spend about $200 dollars on equipment, and I’d have myself 40 pounds of free honey every year. He didn’t sell the equipment, but he said it would be easy to find. And, just like that, they were. I never even got to talk to my husband.